Keep your cat's gorgeous coat in check. Cats tend to have lovely, thick and glossy coats -- the picture of health. However, a variety of different factors can greatly affect that. 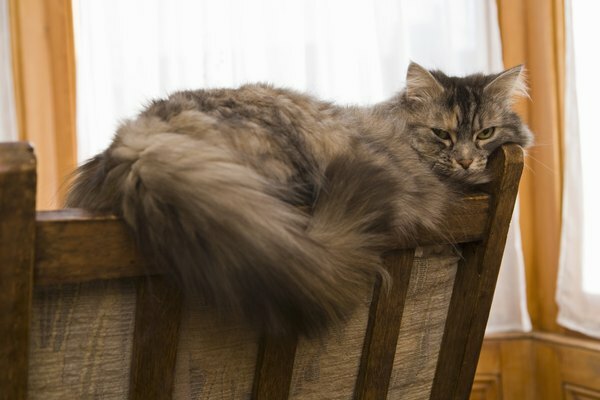 If you notice that your sweet kitty's fur is looking sparse and less than stellar, take the time to investigate the the possible reasons why. One very common and essentially harmless culprit behind feline hair loss is excessive grooming. If your meticulous pet spends an obsessive amount of time each day cleaning her coat, it could actually be doing more harm than good for her. If she licks her hair too much, she could actually be pulling out thick clumps. To remedy this, keep your cat's focus off the bad habit by offering her stimulating toys -- think catnip-stuffed animals, balls and feather wands. If your bored cat feels occupied and engaged, she will likely spend a lot less time grooming herself. An underlying medical condition could also be contributing to your furry pal's loss in hair. To figure out exactly what is going on in your kitty's health, schedule an appointment with her veterinarian immediately. Some ailments that often involve hair loss include various thyroid issues, severe emotional stress, feline immunodeficiency virus, Cushing's disease, mange, indolent ulcers and stud tail. Remember, the sooner you take your cat to the vet, the easier fixing and managing the problem will likely be. Shedding is a totally natural and common reason behind kitty hair loss. During warmer times of the year, shedding-related hair loss is much more common, especially if your cat spends a significant amount of time outside. Pay attention to her shedding patterns. If you suddenly notice an unusually large portion of her hair missing, take her to the vet -- normal shedding should not lead to large, conspicuous bald spots in her coat. Stress and anxiety issues are often behind hair loss in poor kitties. Many things can lead to cats being overly stressed out, from moving homes to the loss of a fellow pet companion. If nerves rather than boredom are causing your cat to groom too much -- and as a result pull out her hair -- then it's up to you to help her adjust and get back on the path to relaxation and glowing health. Some ideas for calming your kitty include regular playtime sessions, interactive toys and designating a calm sanctuary for her within your home. If your pet's stress is caused by the introduction of other new animals in the household, the last suggestion may absolutely be a lifesaver! Why Do Cats Rub Against Each Other? Why Do Cats Spray Indoors? Why Do Cats Like to Lay on Newspapers?